NCRCL lecturer Laura Atkins spent this past weekend attending the British Isles SCBWI (Society of Children’s Book Writers and Illustrators) annual conference – hearing talks from Frank Cottrell Boyce, Anthony McGowan, Chris Riddell, and others. She has posted notes from the conference on her blog – so far Frank Cottrell Boyce’s keynote lecture, Anthony McGowan on Controversy in YA Fiction, and Anthony McGowan on plotting. There’s more to come, including notes on books that sell, and a panel talking about the state of the nation (in terms of publishing and selling children’s books). On Tuesday 6 December Europe House will host an event on translating children’s literature into English. It will take the format of workshop sessions, where students working from various languages into English will translate samples from classic children’s literature or literature closely related to the classics in style and theme, followed by a panel discussion and evening reception. the various possible approaches to the translation of children’s literature and in particular the differences and similarities in translation strategies across languages. Each workshop will be coordinated by a leading translator of the respective language pair, with the findings of each workshop presented to the other participants in a concluding panel discussion. The languages covered in the workshops will be Danish, Dutch, French and German. – The Danish workshop (Hans Christian Andersen) will be led by Dr. Kirsten Malmkjaer and is sponsored by the Danish Embassy. – The Dutch workshop (Annie MG Schmidt) will be led by David Colmer and is sponsored by the Dutch Embassy in London and the Dutch Foundation for Literature. – The French workshop (Antoine de Saint-Exupéry) will be led by Ros Schwartz and Sarah Ardizonne, and is sponsored by the French Institute in London. – The German workshop (E.T.A. Hoffmann) will be led by Anthea Bell and is sponsored by the Goethe Institute in London. – Flanders House will also support and attend the event. The workshops will be preceded by an opening introduction by Dr. Gillian Lathey (the National Centre for Research in Children’s Literature) and concluded by an open cross-panel discussion, which will aim to draw conclusions regarding strategies for translating children’s literature from across Europe into English. This will be followed by a reception offered by the European Commission Representation in the UK. discussion and reception, where they will have the opportunity to meet established translators. Entrance to this event is free but places are limited. To reserve a place please email Tom Barbanneau at: t.barbanneau@imperial.ac.uk (specify for which part you register: workshop+panel&reception OR panel&reception). From the unique black squirrels chasing across campus to stupendous buildings by Frank Gehry and I.M.Pei; from the number of Nobel prize winners on the academic staff to the dozen or so libraries and a world class art gallery – Princeton is impressive in every respect, and it’s particularly striking to see just how many of the resources and buildings have been endowed by alumni and benefactors. I’d been invited to participate in a Princeton Community Collaboration, ‘Memory and the Work of Art’ to mark the tenth anniversary of 9/11. Two questions underpinned the entire programme: How do the arts shape our collective memory of the past? And how does art inform our experience of global events? 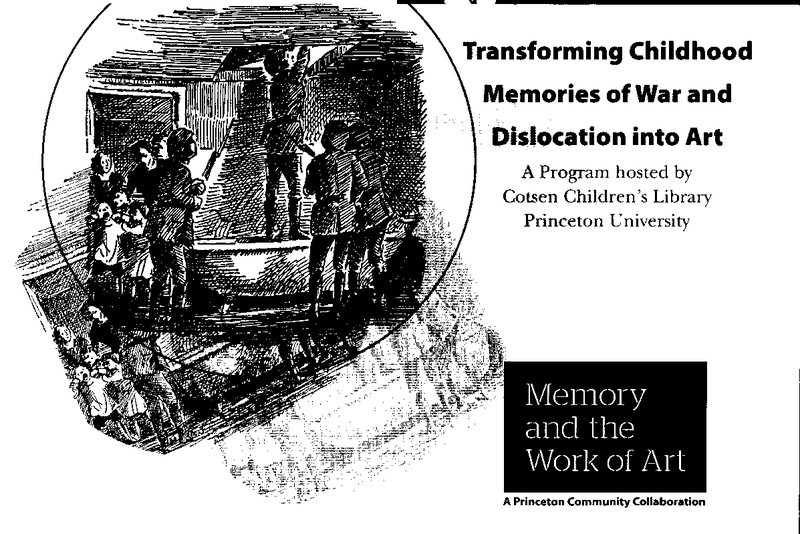 As part of this programme, curator of Princeton’s Cotsen Children’s Library Andrea Immel and Lee Talley of Rowan University co-organised an imaginative event with a focus on childhood, ‘Transforming Childhood Memories of War and Displacement into Art’. I seized the chance to spend a couple of extra days in the Cotsen, a library that combines a lively space for story reading and play. Push-chairs were lined up at the entrance every day as children explored the houses, tree-like structures, cosy corners, book boxes and displays that make the space irresistible. It’s great, too, that much of the research collection of historical children’s literature is visible to all, encased in a high wall of glass-fronted shelves. I spent several hours in the reading room discovering an abundance of treasures, from a peep-show toy theatre of the Great Exhibition of 1851, (a current research interest) to an account of the same by Oliver Ormerod in well-nigh indecipherable Rochdale dialect. (For all you Lancashire folk out there, the details are: O ful, Tru, Un Pertikler Okeawnt o bwoth wat aw seed un war aw yerd, we gooin too th’ Greyt Eggshibishun, e Lundun be O Felley fro Rachde, Routledge 1851). Now for a thumbnail sketch of the event itself. Michael Jennings, Professor of German at Princeton, opened proceedings with a talk on Walter Benjamin’s retrospective memoir of a Berlin childhood, calling it a twentieth century masterpiece in its complex reworking of childhood memory as seen through the distorting lens of late capitalism. Much food for thought there, especially with the newspapers full of Manhatten’s ‘Occupy Wall Street’ camp in Zuccotti Park .Uli Knoepfelmacher, Emeritus Professor of English – who was the first to teach children’s literature at any US Ivy League university – gave a delightfully positive account of his family’s exile in Bolivia, pointing out, however, the luxury of embarking together with his parents on what seemed like a great adventure – as compared to the family separation that Kindertransport children suffered. Lee Talley has discovered a wealth of letters at the Imperial War Museum documenting children’s and their parents’ responses to the British evacuation programme during the Second World War, which she examined alongside children’s literature on the subject. My own paper on the hiatus in childhood reading of German and Austrian exiles in the 1930s dovetailed well with Adrienne Kertzer’s comparison of adult and children’s fiction arising from the Kindertransport programme. It was indeed a memorable afternoon. I left the US wishing – just for a wild moment – that I were 18 again and able to apply for Princeton…….Students who make the grade enjoy a wealth of resources that are, in my experience, second to none.